Follow the path to truth in your life. “WHAT IS TRUTH?” Pontius Pilate asked when interrogating Jesus before his crucifixion. Truth means, in many ways, being only one person. You are the same in front of all humans as you are in front of God. No more masks, no more acting. You are free to be yourself. How important is this to you? For many, this idea is actually terrifying. Many of us have lived or live secret lives. Some go to any length to prevent the truth from coming out. But guess what? The truth is already out. Someone, somewhere already knows your truth. It might be only on an intuitive level, but it cannot be hidden. We like to think we’re in control, but it’s all just a fantasy. Once we begin to let God’s light shine upon us, we see that the phantoms are only in our minds. Then we are given the opportunity to develop something vital to our lives: a strong character. Here’s a personal example. When I was a young father, it was easy to have authority over my children. When they’re little, you’re a hero and a king to them. But as adolescence appears, your kids begin to see you as a human being. They begin to scrutinize, criticize and compare. This process is incredibly humiliating. My initial reaction to many of these challenges was denial. And when denial didn’t work, I sometimes exploded with anger. The reason for this is that when I attempted to exercise my authority at home, I had no character. I had no idea what it meant to be a responsible father. I thought I knew, and perhaps I did know a lot with my head. But in my heart there was a confused and frightened little boy trying to raise boys into men. I didn’t want to see the truth. All of these things brought truth into my life. Initially I had a lot of seriously flawed notions about fatherhood. If it wasn’t for God’s light shining upon my life, that scared little boy would have withdrawn or lashed out even more violently. Instead, God began to form my character. I learned what it meant to be a king, priest and prophet in my home. I learned what it means to be a leader who serves. Jesus showed me how important it is to be a lion and a lamb at the same time, and that many times my instincts were wrong. It was a difficult and lengthy process, but today the Lord reaps the fruits of his labor. No, I’m not a perfect parent, and the process continues to this very hour. But I do have direction and much more clarity than when I started. This is how God’s truth forms your character. Why does this happen? Because Jesus teaches you how to resist temptation. And the measure of your character is how you respond to temptation. Temptation always appears to be something we desire or that appears good. When we fully understand this, we can deflect temptation. In the Book of Matthew, chapter 4, Jesus is tempted by Satan. Before Jesus began his public ministry, he went to the desert to fast. After 40 days he was quite hungry. So the devil temped Jesus with something he would like – food. Then he tempted him with power and influence. Couldn’t all these things be used for good? Of course, but it wasn’t God’s way. Recognizing this truth allowed Jesus to resist temptation. When raising my children, I’m constantly tempted to set limits when I should be flexible, and to give in when I should be firm. My flesh wants the easy way out, and it always appears to me as something reasonable or desirable. In the end it only brings despair upon me. 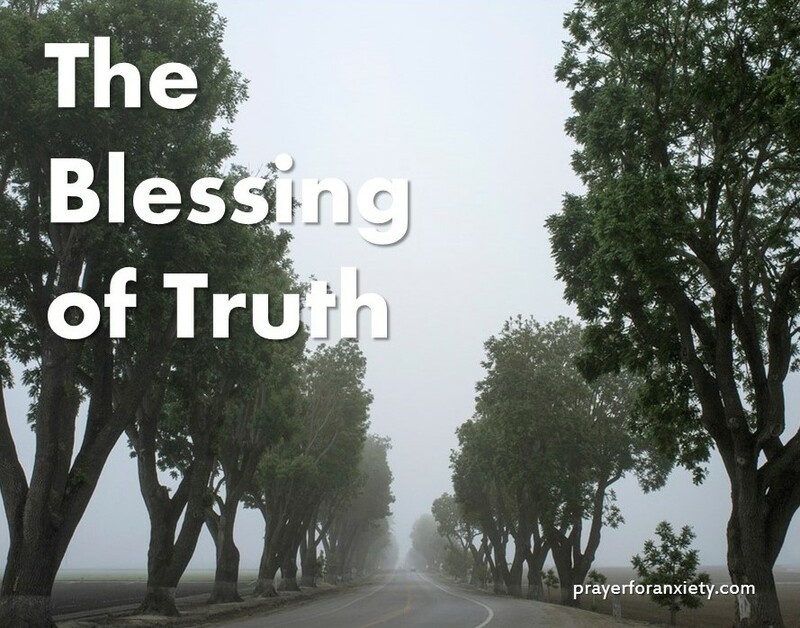 Here’s where the blessing of truth appears. When we come to grips with our weakness then we can see where temptation will most likely catch us off guard. In God’s economy, that which is weak is made strong. When we see and admit the truth of our weakness, then we can ask God to help us where we really need it. We ask him to take control. This could mean that we have to step aside, or it might mean that we have to stand up and fight. For the Christian, the greatest truth is Christ resurrected. The rising of Jesus from the dead is the central event that causes the most commotion around our faith. But it’s also our greatest strength. Any great person can inspire you, but only one can transform you. This is because Jesus is God’s son, and he was raised from the dead by God’s Spirit. This gives us victory over sin and death. It gives us victory over our pettiness of not facing the truth. And when the flood comes and the waters are rising, this truth gives us the courage, hope and strength that we could never muster on our own. And based upon the truth of his resurrection, you can rise up and face the giants that try to tell you all is lost. The truth is that a great King won a victory for you upon the cross. He gave his life for you, and you are his child. In this truth, blessings abound and all things are possible. This post is an excerpt from Vince’s book, Is Jesus Real? Can Jesus Help Me? Order from Amazon today.